The kids are all excited to get back out on the neighborhood hill where everyone gathers for some good old-fashioned winter fun. But it's important for dads to teach children some noteworthy sledding tips in order to prevent any trips to the emergency room. Here are some helpful suggestions to mull over. Although this may seem like common sense, sometimes kids can forget to mind their surroundings. After all the fun of sledding down the hill, they may be so excited to get back to the top that they forget to clear the path for the other sledders. A father should be mindful of where his children are on the hill and make sure they're paying attention to their surroundings. While the biggest hill in town may provide the steepest ride, the trees at the bottom are a definite hazard to children. Protecting your kids is the No. 1 unwritten rule of fatherhood, so while they may be disappointed that you won't let them ride the big hill, they'll thank you when they're older when they don't have debilitating injuries from childhood. 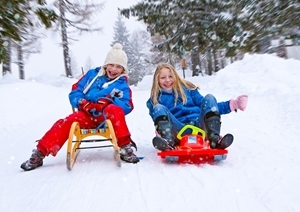 Reckless sledding can be dangerous, so be sure to teach your kids the importance of safety. It'll keep them out of the hospital and leave you stress free!